From a visual standpoint, and especially at its sparse running time of just 39 minutes and affordable price, it’s very hard to go wrong with Shout! Factory’s new 4K release of the 2015 IMAX 3D film Humpback Whales. This majestic species has long fascinated Humanity, at least once it ended their widespread slaughter for lighting oil, an activity that nearly drove the Humpbacks to extinction. When it was realized that these giant mammals actually speak with a complex underwater song language, and that they seem to exhibit empathy – even to the extent of protecting other species of animals from attacks by killer whales – conservation and serious scientific study became a global priority. Thankfully, Humpbacks have slowly begun to recover, though much about them is still not well understood. MacGillivray Films’ documentary, which is narrated by actor Ewan McGregor, documents what is known about these graceful creatures, and follows researchers seeking to study them, as well as rescuers who come to their aid when they become entangled in fishing nets. It’s illustrated with extraordinary 65mm IMAX film footage shot both above the surface of the ocean, in boats and planes, and also underwater. The detail and color is gorgeous, though from time to time the speed of a whale breaching exceeds the camera shutter speed, causing a tiny bit of blurring. Still, this material is breathtaking. The film’s first shot of a whale starts with the camera just beneath the surface. Then the view rotates 180 degrees, so that the surface of the ocean above becomes a roiling membrane-like horizon below, over which this extraordinary creature suddenly seems to be flying. Stunning! Shout! Factory’s 4K release is a 2-disc set. 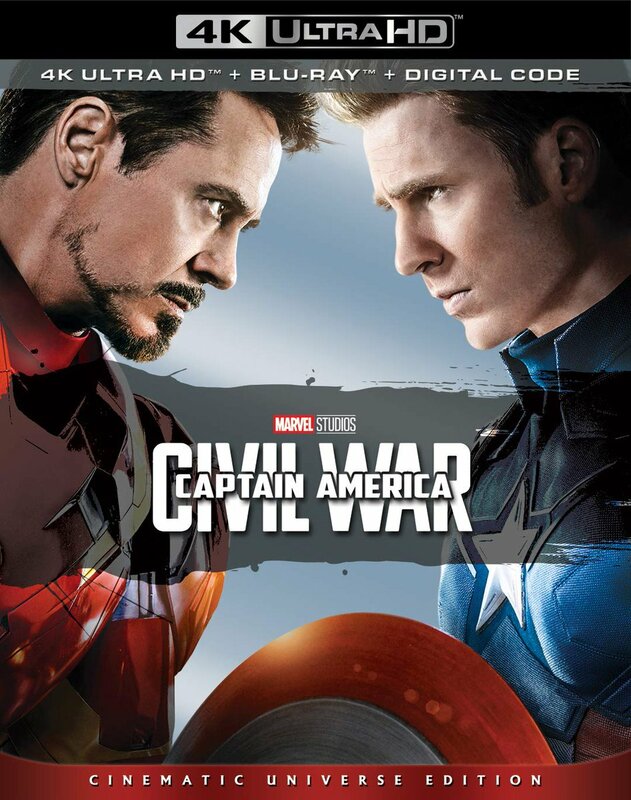 The first is a 4K Ultra HD Blu-ray disc that includes two versions of the film in 4K – one with HDR and one without. The original IMAX footage was scanned digitally at an impressive 11K resolution (10928 x 8192), which was then down-sampled to 4K (3840 x 2160) for this release. The film’s soundtrack is included in a very good English Dolby Atmos mix that immerses the viewer fully in the visuals, surrounding you with whale song and other atmospheric sound cues. Audio options are also available in 5.1 DTS-HD Master Audio in both French and Spanish, with optional English subtitles. 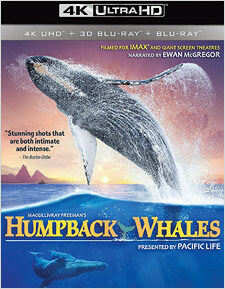 Extras on the 4K disc include the 17-minute featurette, The Making of Humpback Whales, as well as trailers for The Last Reef, Wonders of the Arctic, Rocky Mountain Express, Journey to Space, Flight of the Butterflies, and Humpback Whales, all of which are either now available or coming soon to 4K UHD Blu-ray from Shout (click on the title links for our reviews of each). 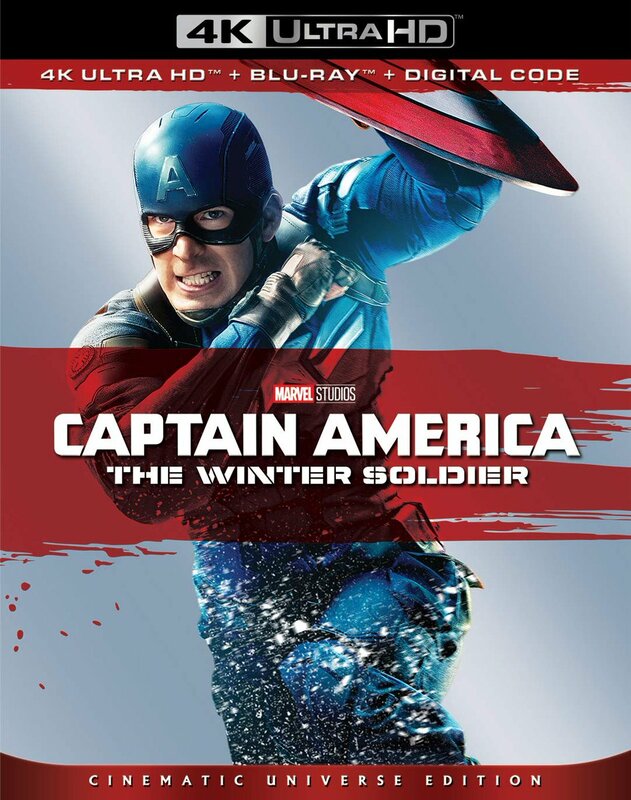 In a very nice touch, the second disc in this package is a Blu-ray that includes the film in high-definition in both 2D and 3D versions, each of which are solid presentations, as well as the same bonus features listed above. There’s also a code for a digital download version. If you’re looking for fun and affordable 4K content, especially illuminating and visually thrilling material that you can watch with the whole family, Shout! Factory’s Humpback Whales in 4K Ultra HD Blu-ray should be near the top of your list.